All aircraft generate wake turbulence during flight. This disturbance is caused by a pair of counter-rotating vortices trailing from the wingtips. 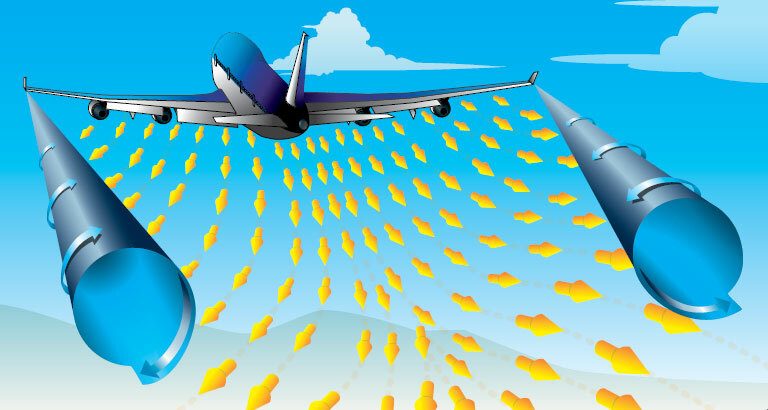 The vortices from larger aircraft pose problems to encountering aircraft. The wake of these aircraft can impose rolling moments exceeding the rollcontrol authority of the encountering aircraft. Also, the turbulence generated within the vortices can damage aircraft components and equipment if encountered at close range. For this reason, a pilot must envision the location of the vortex wake and adjust the flight path accordingly. Wake turbulence has historically been thought of as only a function of aircraft weight, but recent research considers additional parameters, such as speed, aspects of the wing, wake decay rates, and aircraft resistance to wake, just to name a few. The vortex characteristics of any aircraft will be changed with the extension of flaps or other wing configuration devices, as well as changing speed. However, as the basic factors are weight and speed, the vortex strength increases proportionately with an increase in aircraft operating weight or decrease in aircraft speed. The greatest vortex strength occurs when the generating aircraft is heavy, slow, and clean, since the turbulence from a “dirty” aircraft configuration hastens wake decay. En route wake turbulence events have been influenced by changes to the aircraft fleet mix that have more “Super” (A380) and “Heavy” (B-747, B-777, A340, etc.) aircraft operating in the NAS. There have been wake turbulence events in excess of 30NM and 2000 feet lower than the wake generating aircraft. Air density is also a factor in wake strength. Even though the speeds are higher in cruise at high altitude, the reduced air density may result in wake strength comparable to that in the terminal area. In addition, for a given separation distance, the higher speeds in cruise result in less time for the wake to decay before being encountered by a trailing aircraft. Trailing vortices have certain behavioral characteristics that can help a pilot visualize the wake location and take avoidance precautions. Vortices are generated from the moment an aircraft leaves the ground (until it touches down), since trailing vortices are the byproduct of wing lift. [Figure 14-46] The vortex circulation is outward, upward, and around the wingtips when viewed from either ahead or behind the aircraft. Tests with large aircraft have shown that vortices remain spaced a bit less than a wingspan apart, drifting with the wind, at altitudes greater than a wingspan from the ground. Tests have also shown that the vortices sink at a rate of several hundred feet per minute, slowing their descent and diminishing in strength with time and distance behind the generating aircraft. When the vortices of larger aircraft sink close to the ground (within 100 to 200 feet), they tend to move laterally over the ground at a speed of 2–3 knots. A crosswind decreases the lateral movement of the upwind vortex and increases the movement of the downwind vortex. A light quartering tailwind presents the worst case scenario as the wake vortices could be all present along a significant portion of the final approach and extended centerline and not just in the touchdown zone as typically expected. The following procedures are in place to assist pilots in vortex avoidance in the given scenario. Landing behind a larger aircraft on crossing runway—cross above the larger aircraft’s flight path. Landing behind a departing aircraft on the same runway—land prior to the departing aircraft’s rotating point. Departing behind a large aircraft—rotate prior to the large aircraft’s rotation point and climb above its climb path until turning clear of the wake. For intersection takeoffs on the same runway—be alert to adjacent larger aircraft operations, particularly upwind of the runway of intended use. If an intersection takeoff clearance is received, avoid headings that cross below the larger aircraft’s path. 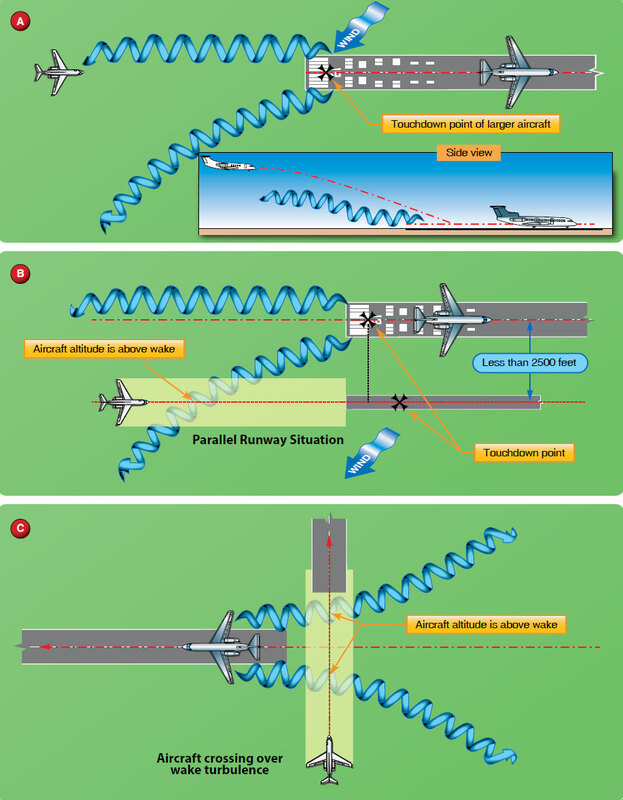 If departing or landing after a large aircraft executing a low approach, missed approach, or touch-and-go landing (since vortices settle and move laterally near the ground, the vortex hazard may exist along the runway and in the flight path, particularly in a quartering tailwind), it is prudent to wait at least 2 minutes prior to a takeoff or landing. En route, it is advisable to avoid a path below and behind a large aircraft, and if a large aircraft is observed above on the same track, change the aircraft position laterally and preferably upwind.